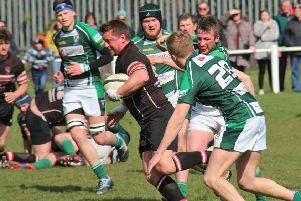 Halifax RUFC’s hoped-for Yorkshire Four promotion party had to be put on ice yesterday. The first team’s penultimate league game of the season away to Wensleydale was postponed after the coach containing them and a Dukes side from the Ovenden Park club suffered a flat tyre on the way to Leyburn in North Yorkshire. Halifax player Tony Curtis, on a rugby union forum, said that a combination of a bolt through a tyre and the wrong spare had led to a lengthy stay at a service station. Despite the efforts of two mechanics, they had been unable to fix the problem in time. “Thanks to the league, the referee and Wensleydale for their help and support as we tried to get to the ground,” said Curtis. The game will have to be re-arranged. It wasn’t all bad news for Halifax, however, because Skipton’s hopes of pipping them for second spot were virtually extinguished by a 63-0 hiding away to champions Wetherby. That scoreline was bettered by Halifax Vandals, who crushed visitors Leeds Corinthians by 67-0 in the same section.